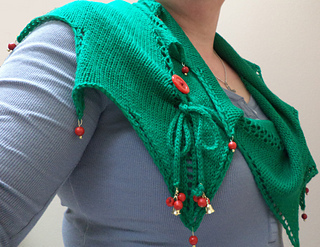 This is a quick and fun 1 skein project. 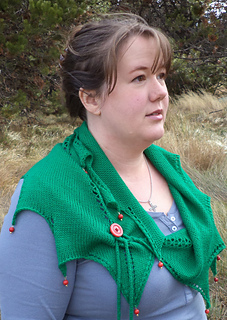 Any color yarn will work and it would look great in self striping or color change yarn. At least 30 red berry beads of your choice, about the size of a pea or a blueberry….or a holly berry. At least 30 gold “head pins” used in beading. A large red button, or one that matches your beads, or one that you just like because it’s pretty. 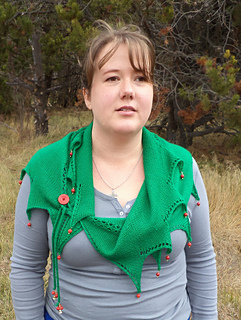 A button about the size of a quarter, it needs to fit through your center stitches like a button hole. You will also need needle-nose pliers to bend the wire and a wire cutter. 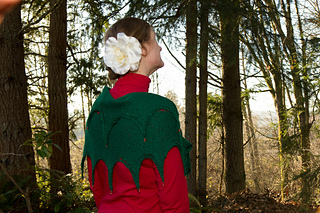 This is part 1 of 4 leaf shaped shoulder shawl/scarf patterns that will release on the first day of each season. 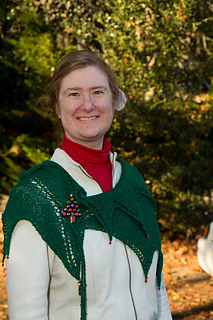 Except this month, no one wants to wait until two days before Christmas to knit a holly leaf. The ebook will be available for purchase in September.